Tonkatsu is a fried Japanese pork cutlet that's usually served with a sweet and savory spiced fruit sauce. My version features a tender thick-cut rib-chop that's been dredged in panko breadcrumbs and fried until shatteringly crisp on the outside, and juicy on the inside. Call me a geek, but I’m a bit obsessed with the history of food. Contrary to popular belief, even the most “authentic” dishes are often influenced by ingredients or techniques from other parts of the world. That’s because the journey of food parallels the journey of humankind, taking unexpected twists and turns, which bring ingredients and techniques continents away from where they originated. For Tonkatsu (豚カツ), it’s not entirely clear where the journey started, but deep-frying is not a native method of preparing food in Japan. The first written account of the dish is in a cookbook published in 1872 called Seiyou Ryouritsu (literally “The Western World Cookbook), which describes a breaded and fried dish called Whole Cutlet (フォールカツレツ – Fohru Katsuretsu). The first recorded appearance on a restaurant menu was at Rengatei in Ginza around 1899 going by the name of Pork Cutlet (ポークカツレツ Pohku Katsuretsu). The timing coincides with the Meiji Restoration which brought with it the opening of trade with the West along with a constitution that was modelled after the legal structures of the German Empire. The English name suggests the British or the Americans introduced it, but the true origin of the dish is most likely the Austrian Wiener Schnitzel, or the Italian Cotoletta alla Milanese. The name Tonkatsu didn’t appear until later and is a portmanteau of ton, which means “pork” in Japanese and katsu, which is an abbreviation of katsuretsu, the Japanese transcription of “cutlet”. Whatever its origins, Tonkatsu’s popularity has spread all over Asia with regional variations, such as in Korea, where it’s known as donkkaseu (돈까스). Since this is a simple dish that only has a few ingredients, the quality of each ingredient matters. The most important component is the pork, and you’ll want to splurge here on a tender cut with good marbling, that hasn’t been frozen. I like using either a loin chop(leaner) or rib chop(richer), but be sure to look for one with even marbling and without much connective tissue like gristle. 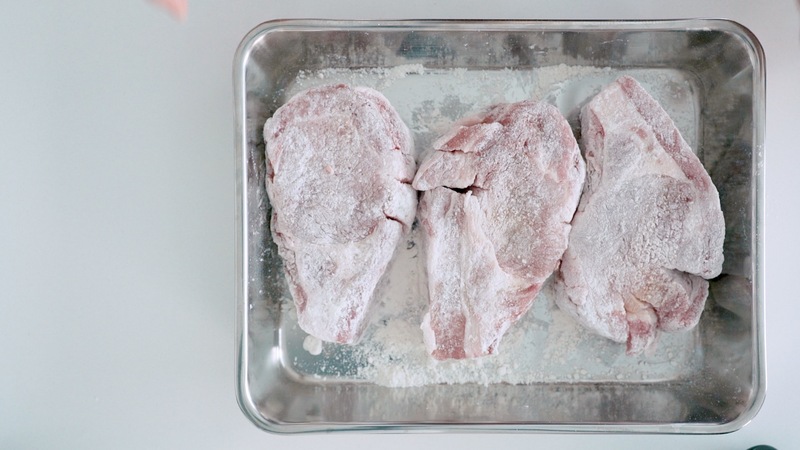 I also prefer my cutlets to be thick, as this helps to keep the meat from drying out as you fry it. If you can afford it, I highly recommend using a heritage breed of pork such as Kurobuta, Berkshire or Iberico as these all have great texture and flavor with a decent amount of fat marbled into the meat. 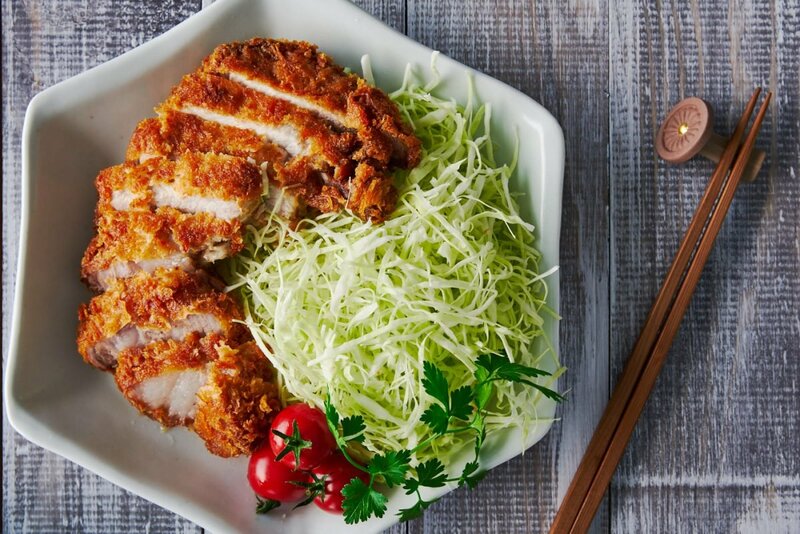 One of the things that set Tonkatsu apart from other cutlet dishes around the world is the use of Panko. Panko is a Japanese-style breadcrumb made from the white part of sandwich bread, and it was originally made by shredding fresh bread, rather than pulverizing stale bread, which is why the crumbs are much larger than western breadcrumbs. For my Tonkatsu I used fresh panko (生パン粉 – Nama Panko), which is basically shredded bread. If you can’t find it, you can make your own by removing the crusts from sandwich bread and shredding it by hand. The crusts need to be removed because they’ve already browned in the oven. If you make panko from a whole piece of bread, the crust parts will end up much darker than the white parts. Japanese love their cabbage, and a plate of Tonkatsu is not complete without a big pile of shredded cabbage. You want to use the tender inner leaves of a head, removing the tough stems before you shred it. I also like to soak the cabbage in water, which not only crisps it up, it tames the funky cabbage smell to an extent. To season the cabbage, I usually just pour some extra tonkatsu sauce on it, but it’s also delicious with some ponzu, or a light vinaigrette. Tonkatsu sauce can be purchased from most Asian supermarkets, and I’ve even seen it in regular supermarkets in areas with an Asian population. If you can’t find it near you, try searching for it on Amazon. If you still can’t get it, you can make a reasonable facsimile of Tonkatsu sauce by whisking together two parts Worcestershire sauce, one part ketchup, and one part honey. Because this dish is so simple, there’s not much to it, but there are a few key points to remember. 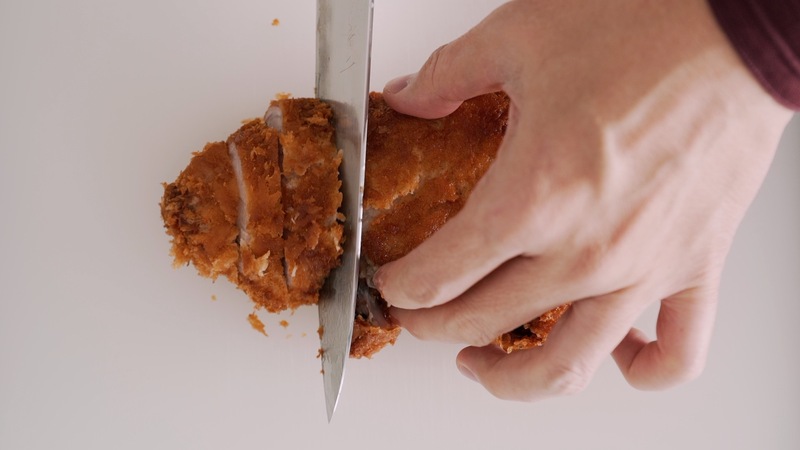 First I like to season the cutlet with some salt and pepper because the sauce only seasons the breading. Next, a thin dusting of flour goes on to the surface of the pork, which together with the egg it gets dipped in, creates a glue that helps the panko adhere to the meat. Once it’s breaded, all that’s left to do is to fry it, but there are a few things to keep in mind. The pork cutlets are quite thick, so if you fry it at a high temperature, the panko will burn before the meat is cooked through. That’s why I fry it at a relatively low 320 degrees F for a longer time. I’ve also found that the lower temperature keeps the meat juicier. Finally, if you didn’t get the memo, the FDA revised the safe temperature of pork down to 145 degrees F a number of years ago, so you can stop ruining it by cooking it to 160. I like to fry my Tonkatsu until it reaches an internal temperature of 140 degrees F, and then let it rest for about 5 minutes. 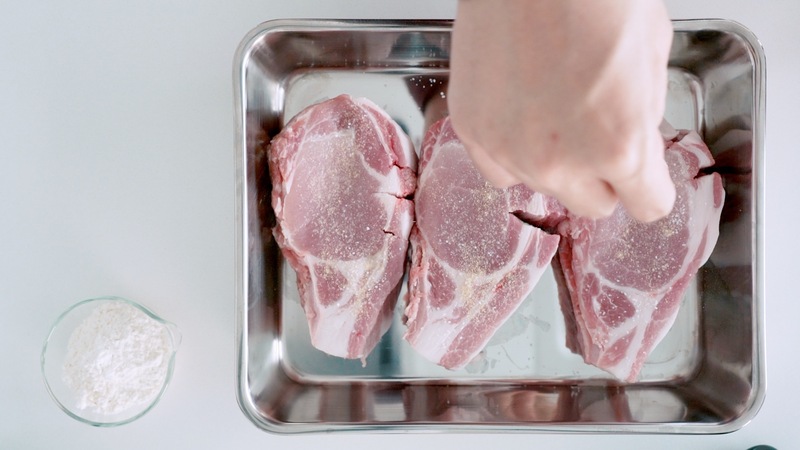 The carry-over cooking will cook the meat through, and the time will give a chance for the proteins to relax and the juices to redistribute, so don’t end up with a puddle of pork juice making your cutlet soggy when you slice it. 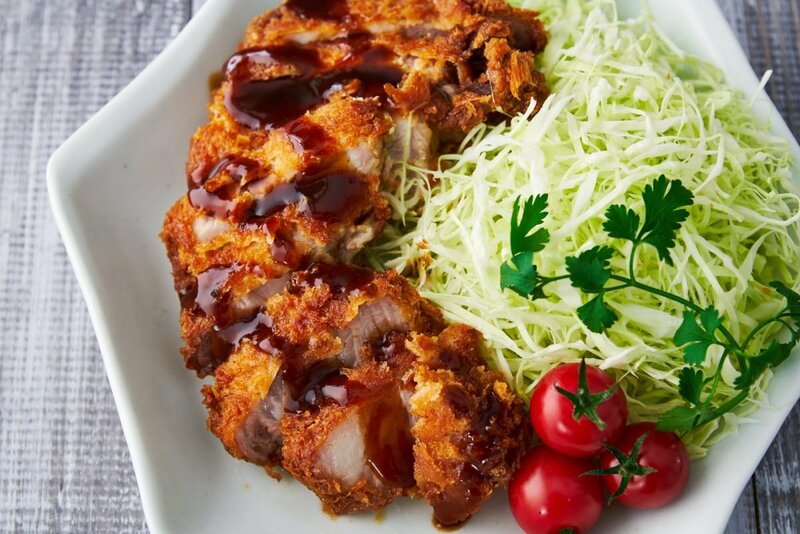 Traditionally Tonkatsu is served with a nest of shredded raw cabbage, hot Japanese mustard and a sweet and savory spiced fruit sauce called Tonkatsu sauce (トンカツソース). The cabbage provides a fresh balancing respite from the rich pork, while the sauce not only seasons the pork, it provides a delightful contrast in the same way that barbecue sauce takes ribs to the next level. Another common way to serve it is with a generous blanket of Japanese curry on top. 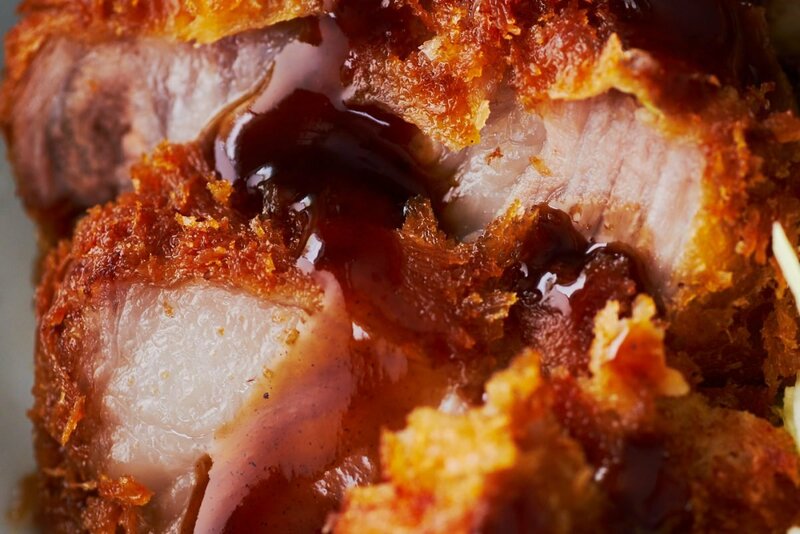 There’s something divinely satisfying about biting through the crisp golden panko into the tender, juicy pork while the sweet, spicy curry swirls around in your mouth. This combo is also one of the most well-loved comfort foods in Japan. There are also regional and seasonal ways to eat Tonkatsu. For instance, in the Nagoya area of Japan, they eat Tonkatsu with a sweet miso sauce, and in summer Tonkatsu is often eaten with the refreshing combination of grated daikon radish and ponzu. Don’t be shy about frying up extra Tonkatsu because there are a ton of ways leftovers can be upcycled into other dishes. One of my favorites is Katsudon, which is a rice bowl topped with Tonkatsu that’s been simmered in dashi, soy sauce, sake, and onions, and finished with some beaten eggs it makes this divine omelet that’s saucy enough to season the rice underneath. Another great way to use leftover cutlets is to turn it into a sandwich. You’ve probably heard of those ridiculously expensive Katsu Sandwiches sweeping the nation, and while many of those are made with beef katsu, the original Katsusando is made with Tonkatsu. 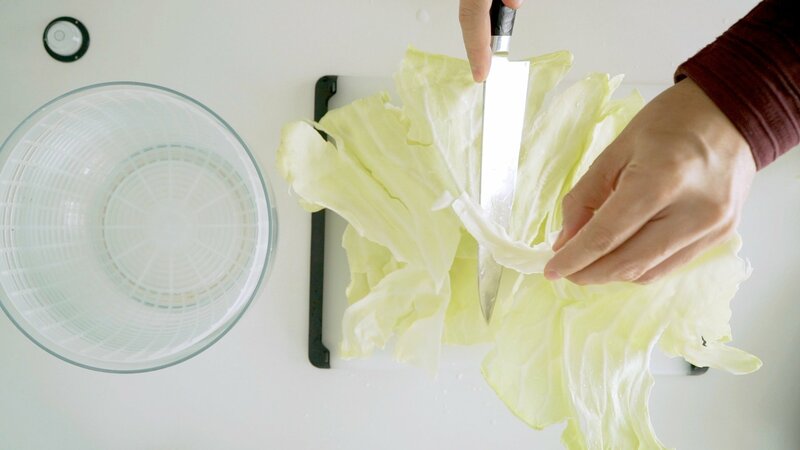 To prepare the cabbage salad, separate the leaves from the head, and trim off the tough stems. 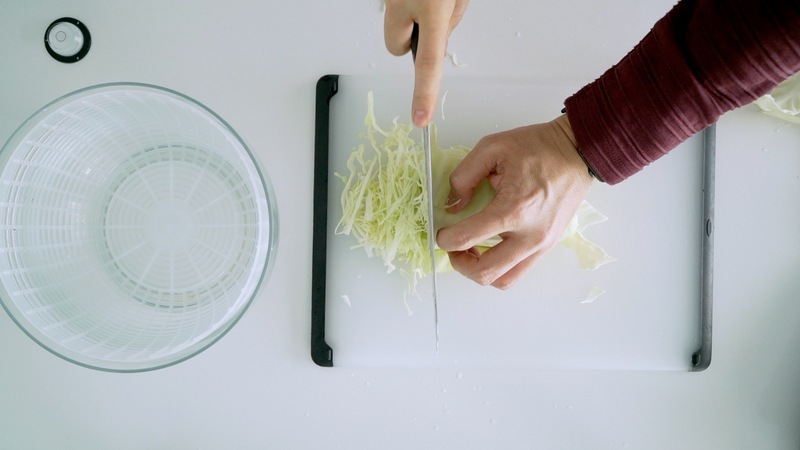 Roll a few leaves together and use a sharp knife to slice the cabbage into thin threads. Soak the cabbage in cold water while you prepare the rest of the ingredients. 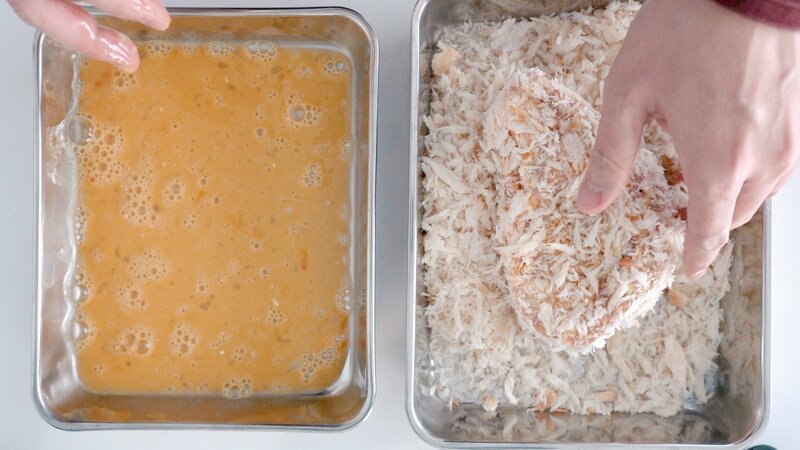 Prepare two trays, one with a well-beaten egg and the other with the panko. 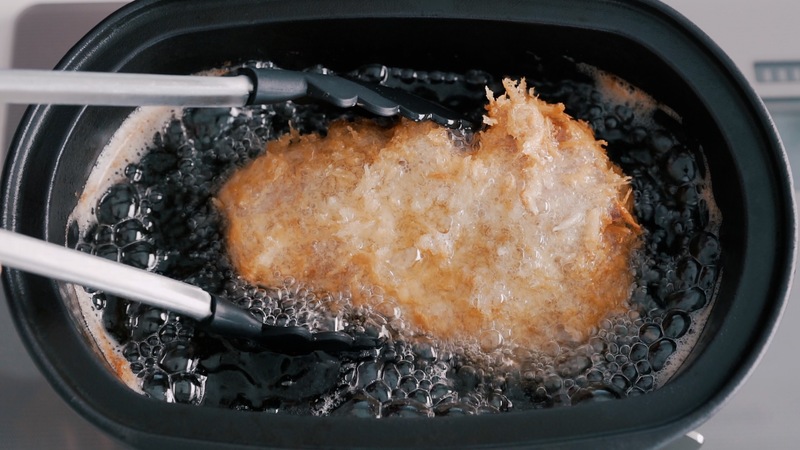 Prepare a wire rack to drain the Tonkatsu Add 1 1/2-inches of oil to a heavy bottomed pot and heat the oil to 320 degrees F (160 C). Salt and pepper both side of the pork cutlets. Dust the pork with an even coating of flour. Dip the cutlets in the egg and coat evenly. 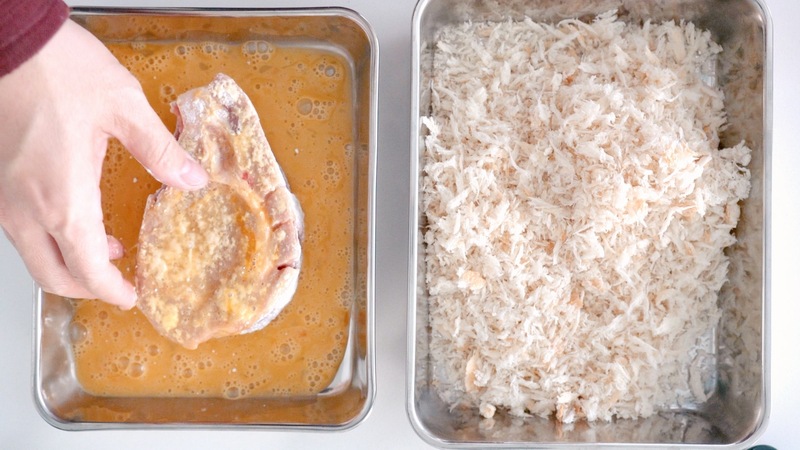 Transfer the pork to the panko and mound the breadcrumbs around the meat, pressing down gently on the cutlet to ensure you get a good coating of breadcrumbs on all sides. Fry the Tonkatsu until golden brown, flipping every few minutes to ensure even browning. 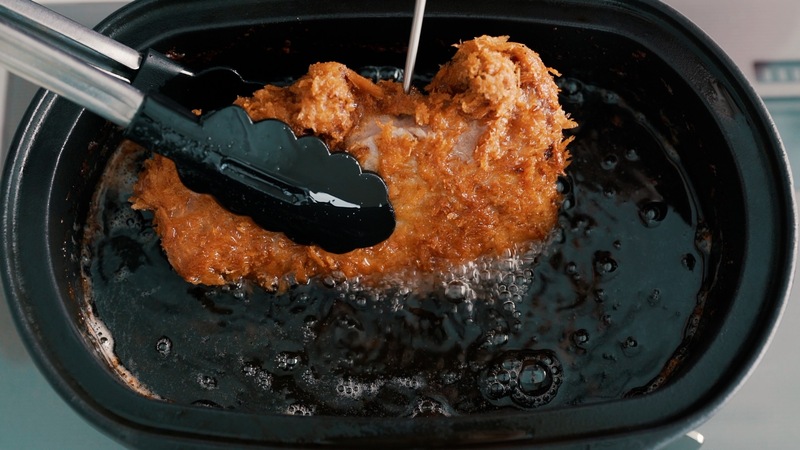 Use a skimmer to remove any foam that accumulates on the surface of the oil. Depending on how thick your chops are they will take anywhere from 10-15 minutes to cook through. You can test to see if they're done by removing one from the oil and inserting an instant-read thermometer into the center. It should register 140 degrees F (63 C). When the Tonkatsu is done, drain it on a wire rack and let it rest for a five minutes before you cut into it. While the pork rests, drain the cabbage and use a salad spinner to remove any excess moisture. Place big mounds of cabbage on each plate. Slice the cutlets and plate with the cabbage. Serve with Tonkatsu sauce and Japanese mustard. My kids favorite is chicken katsu. We have a great low price restaurant here that makes a great salmon katso for like $8.95, a full set miso, side of sushi etc. The owner only raises the price when Ruth Chris raises the price on their baked potato. Nice looking tonkatsu! Tonkatsu is one of my favorites. 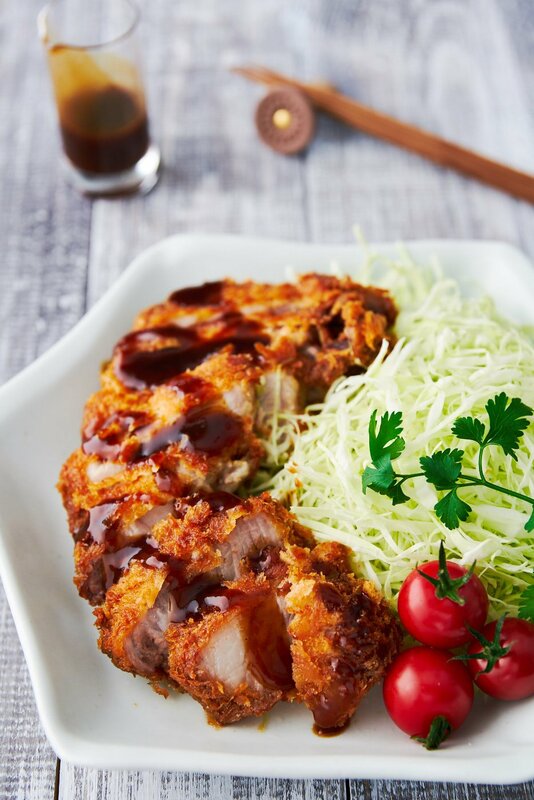 It is hard to beat the simplicity of the juicy port cutlet with a crispy coating and a tasty tonkatsu sauce. Thanks for such great tips. The history part is also very interesting. Good to know that Worcestershire sauce can be substituted for Tonkatsu sauce. Its all about the katsu udon for my husband. No doubt one of my favourites, totally agree that it is awesome with a side of curry. In Australia they have been marketing moisture infused pork, I can imagine it going very well with this recipe! my mom always orders berkshire pork specifically for katsu! only, we eat it with daikon oroshi + shiso leaves + sweet & sour garlic sauce. I did not realize that tonkatsu and tempura have European antecedents, so ingrained are they in my mind as wholly Japanese dishes! The history of food migration is so fascinating. I was debating between chicken and pork for dinner but you have helped make up my mind! Off to the store for some chops . . .
you’re on a roll these days w/ cooking up the classics – tonkatsu, chop suey, teriyaki. god, one of our fave japanese restaurants does the BEST katsudon(i know, a bit more to it than a tonkatsu. i really only eat it in the winter though b/c the bring it out in these beautiful ceramic container w/ a lid. they put it in front of you, remove the lid and all the smells of the tonkatsu, egg, rice, deliciousness comes together. mmmm. 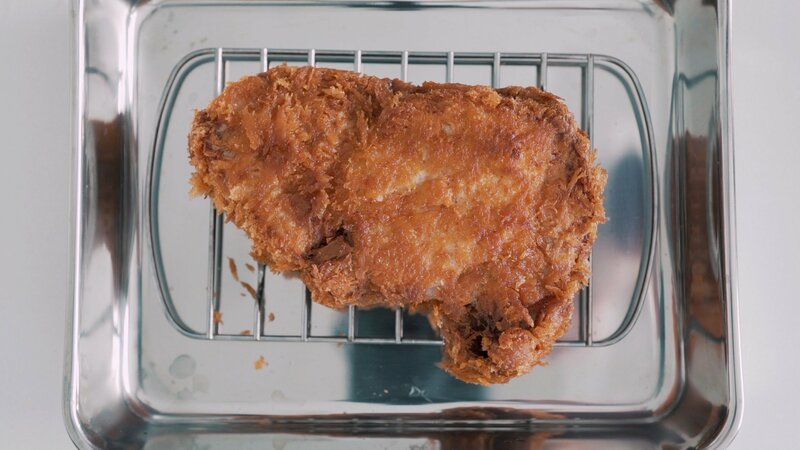 i guess we’re on a fried meat wavelength! I have been making a list for our weekly meals, and I think you just made my list shorter…looks good! Wow I love the idea of this! That pork looks lovely covered in panko. You’ve also reminded me that I still haven’t tried Japanese curry. Every time I visit your blog my list of ‘must makes’ gets longer and longer lol but I love it! that pork looks delicious especially with the panko breadcrumb texture, I need to check out Japanese curry as well. The curry does sound good. Must redouble my efforts to find curry sans MSG! Hi Tiffany, have you thought about trying to make the curry roux from scratch? There’s a link to my recipe for Japanese curry (sans MSG) from scratch up in the post. Hi Janet, you can actually double coat tonkatsu too, but I find that if you press on it, it picks up enough panko in one coat to give it a nice thick crust. I’m guessing some people double coat schnitzel because the breadcrumbs are finer and thus create a thinner layer than panko. Oooookay, yes, yes I think I’ll try that. Bourdain had curried rice in an episode of No Reservations and it’s been killing my husband that he’s not been able to find it sans MSG. Thanks! your tonkatsu looks amazing ^^ tonkatsu is one of my fave Japanese food, I’ve got to try to make it at home next time. Love the tips abt pork selection and tenderising the meat. This has always been one of the faves to order at restaurants. Guess we could give it a whirl at home. Love pork cutlet and made as Tonkatsu looks even better …. great dish! Thanks for sharing this with us. We love Tonkatsu around here, but we make it with chicken since we don’t eat pork. I was hoping you would also have a recipe for the sauce as I cannot eat it anymore due to being gluten-free. And yes, I know the tonkatsu has wheat in the panko, but I have to substitute rolled oats for that now (unfortunately). Anyway, thanks for posting the recipe as it has reminded me to search for a recipe for the sauce so i can eat it again! These are the type of dishes I prefer where the ingredients have to be top notch and you can’t cover up a %&(*#& up. I love you even more for not cooking pork until it is cardboard. Nicely done and love the history lesson! Wow, looks perfectly fried! I bought a bottle of tonkatsu sauce just for this and my hubs doesn’t like it =( he prefers this with curry.